One thing I love about Jaya Grocer is they have things I like which I can't get anywhere else. Imported Australia beef - grain fed..very tender and which are great for my korean dishes :p Herbs and baking stuff like aluminium free baking powder which I can't get from my usual baking shop. 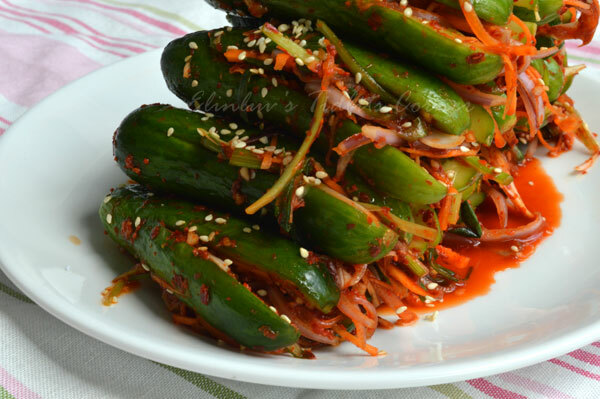 Ok, sorry I have digress again...back on track on this delicious, mouth watering spicy stuffed cucumber kimchi. I bought 2 packs of mini cucumber from Jaya Grocer ( now you know why my mind trails back to Jaya Grocer that deserved a mention in my blog ) This is not a advertisement post. 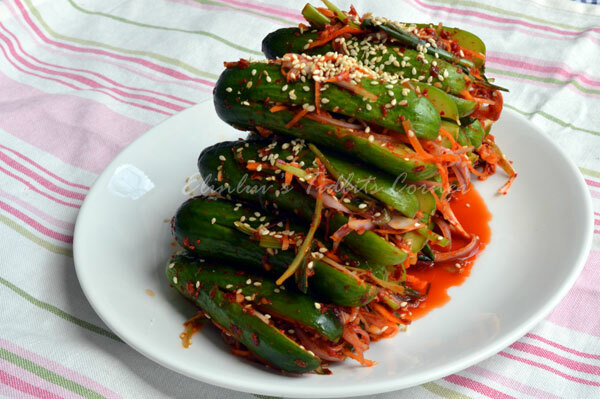 I am a great fan of Maangchi and I love most of her recipes and today I am sharing her mouth watering flavor packed side dish or banchan as it is called in Korea - Oisobagi Kimchi which means Spicy Stuffed Cucumber Kimchi. This is a keeper and I can't wait to share with you .... appetizing and easy to make. 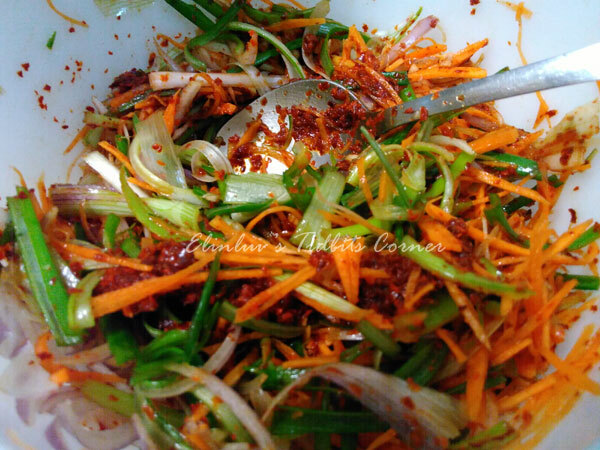 A healthy side dish which even my meat eater at home loves it and asked me to make more. I made a batch and kept them in air tight container, serving them as side dish at every dinner meal. 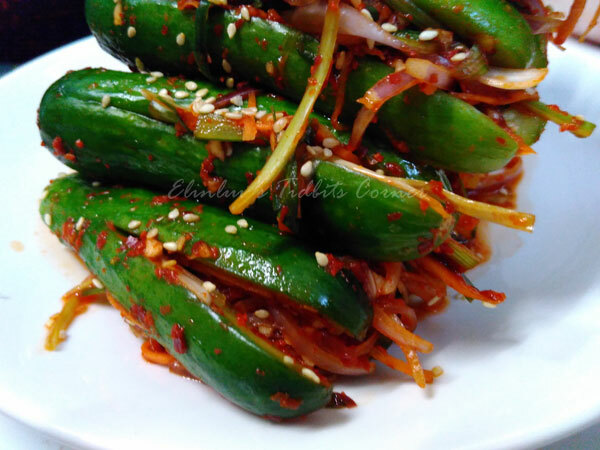 Try it to believe me :) After a week in the fridge, the cucumbers are still crunchy and the flavors deepen even more...a delightful side dish. I can eat many at one go...so addictive ! 1.Wash the cucumbers. Make pockets out of them by slicing them twice lengthwise at right angles, ½ inch from one end so the cucumber quarters are still connected to each other at the end. 2.Put them in a big bowl, and sprinkle and rub them with salt inside and out. Let them sit for 10 minutes on the kitchen counter, and then turn them over so they’re evenly salted. Then turn them over and let them sit another 10 minutes. 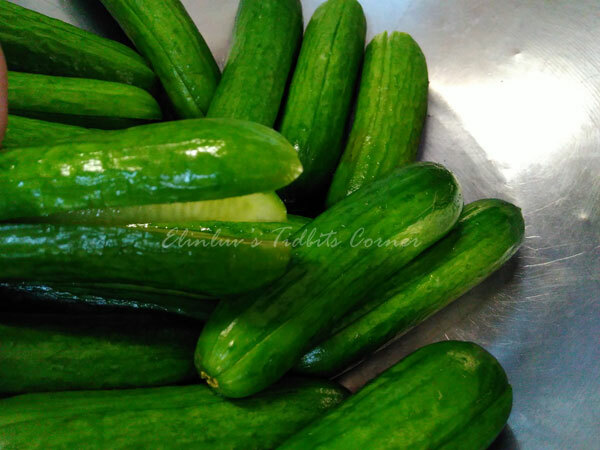 3.Rinse the cucumbers in cold water a couple of times to remove excess salt. Drain and set aside. 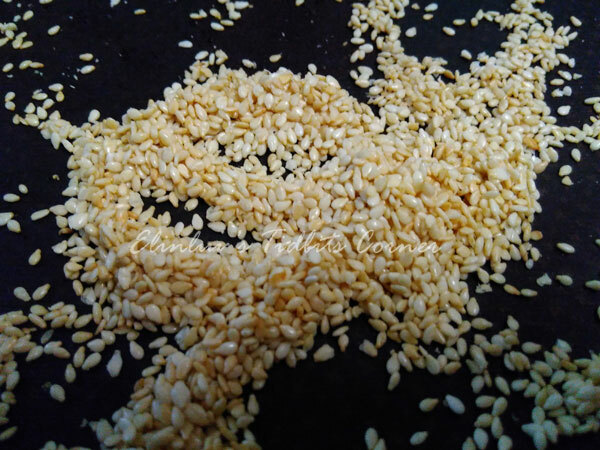 4.Combine buchu (Asian chives), carrot, hot pepper flakes, fish sauce, sugar, and sesame seeds in a large bowl. Mix well with a wooden spoon. 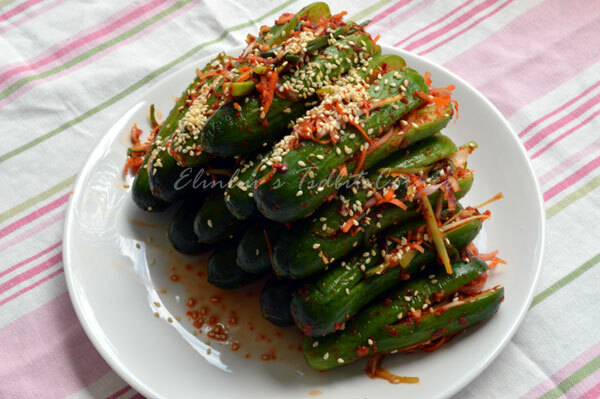 5.Stuff the seasoning paste into the cucumber pockets. If you have sensitive skin, you can wear rubber gloves for this because the paste might irritate your hands. 6.Serve immediately as a side dish for rice, and keep the leftovers in the refrigerator. If you prefer it to be fermented a bit more, let the container sit at room temperature for a couple of days until it smells and tastes sour. Then put it into the fridge. Serve cold. wow these look so crunchy and appetizing! Gosh these look so so delicious! Made such a fantastic side dish. Must make some soon. By the way what kind of chilli flakes you used? 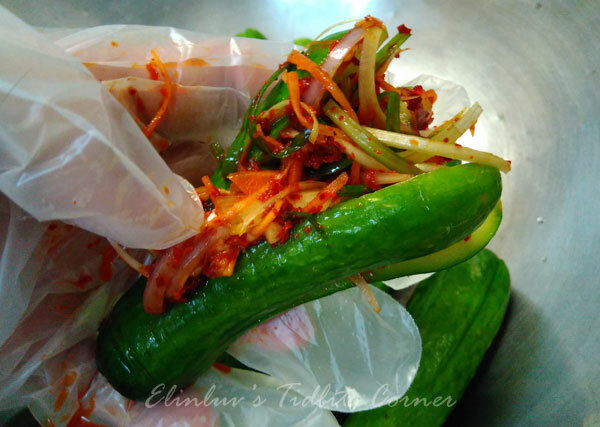 Veronica...this is fantastic...though the name is kimchi but it does not taste like kimchi..cos this does not need to ferment..eat straight away. Delish ! crunchy and spicy...so good. You must try it. Great side dish ! Elin, these looks absolutely mouthwatering. I've to make this soon. Ha ha I am not a kimchi fan. I still prefer our local acar.